WELCOME TO THE LEANN RIMES WEBSITE!!! 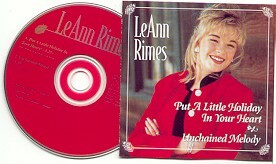 THE ALBUM BY LEANN RIMES IS ALSO CALLED "I NEED YOU" AND THE U.K CD HAS THREE EXTRA BONUS TRACKS. I NEED YOU REMIX, SOON REMIX AND CAN'T FIGHT THE MOOLIGHT REMIX. THE OFFICAL ALBUM WILL BE RELEASED IN EARLY SUMMER AND THE U.K TOUR HAS BEEN CALLED OFF UNTIL FURTHER NOTICE DUE TO PROBLEMS. LEANN RIMES DID NOT KNOW THE ALBUM "I NEED YOU" WAS BEING RELEASED TO THE PUBLIC TO HEAR THE STORY PLEASE SCROLL DOWN. The film Holiday in your Heart with LeAnn Rimes was on in the U.K on the Halmark channel on sky igital. To see this film keep looking out on the Halmark channel. The picture above is the CD "Put a Little Holiday In Your Heart"
This is my homepage for the U.S country singer LEANN RIMES. As many or all of you know, this has been a difficult year for me! In the year before I turned 18 and since, I have been working on getting my business set up in a way that I would like to see it. Unfortunately, in order to do that I had to file a lawsuit against my previous manager and my father. This was an extremely difficult decision because I love my father very much. However, I had no other choice. Another objective of mine was to have a record contract that would be fair both to me and to the record company. At 12 years of age, with my father's advice, I signed a contract with Curb Records. The terms of the contract were never properly explained to me until recently. I did not know, among other things, that the contract with Curb Records was for an initial period plus 6 option periods with multiple albums during each period. This is not fair. I chose at 18 to disaffirm the contract. In December, I was informed by Rendee that Curb Records planned on releasing another album. As you can imagine, I was shocked! This album was made without my creative input. It consists largely of unfinished material and songs that didn't make other albums. I have not heard the album so I cannot tell you my opinion on it. But what I want to make abundantly clear to you is that this album is not a reflection of myself as an artist, but is solely the conception of Curb Records, and for that I am truly and deeply sorry. I want you to also know that your support in these difficult times is extremely important to me. I cherish every letter and never lose sight of you, my fans! CLICK HERE FOR PICTURES OF LEANN RIMES!